I remember exactly where I was when the Enterprise Fawcett Foundry caught fire: the Mount Allison University gym watching the girls basketball team play the Crandall University Blue Wave. I coach the local bantam girls basketball team (go Titans!) and we coaches had decided to take our girls out to see the game: a fun thing to do, team building. Part way through the game my girls and a few of the parents who stayed along with my co-coaches started talking to each other, relaying information they received over their iPhones or Blackberries or whatever other mobile communication device they use. 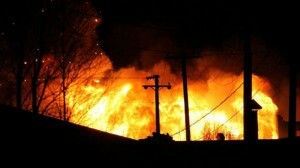 The Foundry was on fire and it was a big fire. At first I was left out of the discussion since I’m one of those Luddites who doesn’t own an iPhone. I needed to rely on my daughter for information. News of the fire soon overtook the game as a discussion in the stands. This might have been because the game was out of control (the hometown Mounties were winning handily) but it also might be because of the importance of the Foundry: to local employment, working-class identity, and history. In a second gallery, there are twelve archival pigment prints mounted on dibond and a nine panel archival print series (also mounted on dibond). This is photography at its best, mixed with an incredibly artistic use of archival materials. In addition to Tombs’s essay, the catalogue contains an historical essay by Bill Parenteau from UNB. Combined, the exhibition and the catalogue constitute a multi-media exploration of an important local workplace and the men who worked there. The mounted archival prints take one through the labour process to the finished products set in a typical small-town Maritime home. The real power of this exhibition, however, lies in the portraits. Rensch presents workers as workers. The men stare straight ahead. Their expressions are not blank, not defiant, not welcoming but human. These images capture real people in remarkable detail. The portraits on the walls don’t smile at you but neither do they chase you away. They look at you as you would look at someone with whom you are about to begin a conversation: they appear interested in you. They’re dressed in work clothes, some are overweight, one man holds a cigarette as his picture is taken. What makes this exhibition important for those interested in an active history is not its commemorative function. It serves that function, but it does more. Rensch’s portraits capture the human dynamic of labour and the workers’ individuality. This is an exhibition about male labour that tries to take the “next step” in its presentation of gendered work. Canadian historians now know a great deal about the gendered dynamics of work and how it both upheld and subverted power relations between men and women. We know a great deal about conceptions of manliness and masculinity and what it entailed for men and women; about gendered divisions of labour, and about the disturbing ways in which gendered power relations linked to work affected social life. One great merit of Rensch’s artistry is that he does not try to retell these stories. Instead, he uses photography and the artistic redeployment of archival sources to let art tell a story that is difficult to tell in words. The archival prints capture the ambiance of work: its location, the heat, the sights of the shop floor, the effort required. The positioning of the finished product — in this case a cast iron pot used in a kitchen — signifies not that the work is over but that it continues in the home. It says not “here is a product” but “here is a product that becomes a work tool placed in another site of labour.” Said differently, work leads to work, even if the gender of the worker differs. The human quality of the male workers is part of this message. It tells a story of the human quality of work that is etched on men’s faces and marked on their bodies. They are ironworkers but they are their own people. The stark opposition between work and life, home and labour, job and identity (so much a part of Generation X narratives like Douglas Coupland’s book that coined the phrase) evaporates in this exhibition. It is interesting that no white collar workers are portrayed; no owners nor town officials. This exhibition is not boosterism because the standard pantheon of local heros (the owners who “built” the factory) are missing. What this exhibition commemorates is the deeply human dimension of labour in small-town industrial Canada. This is an historical lesson that is important to remember. The way I heard about the fire is, for me, also part of the exhibition’s story. Fires, I suppose, can be exciting and will draw a crowd. There certainly was a crowd watching the fire on that January night. For me, though, the interesting point to note is how word spread. New communications technologies brought people to the scene: the technological counterposed against the industrial. It was, as if, one era in communications history became the medium that drew people to watch the destruction of an older mode of production. “Enterprise” is an exhibition that deserves to be seen. It will make you feel history; and make you think about it. What more could we ask for in an active history? Andrew Nurse is a Professor in the Canadian Studies Program at Mount Allison University and a regular contributor to ActiveHistory.ca.